Oftentimes, these individuals may be nervous to talk about their issues to close acquaintences, but completely open to connecting with a caring pastor. As believers in Christ, we know that this world is in darkness and desperately needs to hear the good news of Jesus Christ. Jesus came to this world, lived a sinless life though tempted just as we are, died the death we deserved, and was raised to life to bring us out of death and into new life with the Father. We want to reach these people with the Gospel, give them hope, and connect them to the church. We are blessed to be a fully-funded nonprofit with the mission and vision to reach a billion people with the Gospel. We know the most effective way to do this is through the church, and that's why we created CV Outreach. Got a church website? Have a desire to use it for the Gospel? Fill out the short form so our Community team can call you. From there, our Community Team will be applying for Google for Nonprofits and the Google Ad Grant. We understand that as pastors, your schedules are very busy, so during the onboarding process we like to take the load of the work to get things started. 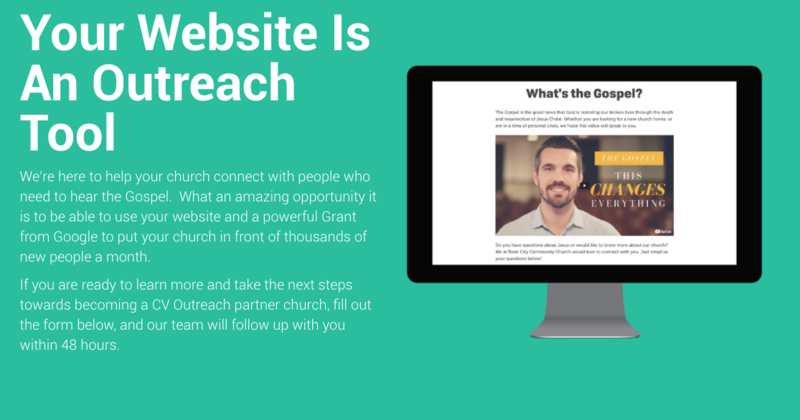 After you have access to Google for Non Profits, the process will be moved to our Web Developer to create the Gospel landing page on your church’s website. After that, our Google Ad Specialists will be writing and running the advertisements to direct traffic to the Gospel landing page. This will be done by targeting specific keywords that people are searching, which allows the advertisement to pop up in the ad space on Google search. Seekers will be able to click the button under the video on the Gospel landing page and have the opportunity to send an email directly to you. What we’ve seen come in are questions, prayer requests, or even people just looking for someone to listen to them. The Church is the most important role in all of this, to share the Gospel and encourage them to become true followers of Jesus Christ, so we know we can’t do any of this without YOU. There will be ONE landing page on your church website that will actually be able to pull in different videos depending on the topic the seeker has searched. For example, if someone is struggling with their marriage and has searched, “How to save a marriage?”, a testimonial video of a couple sharing the hope they found in Christ during struggling with their marriage will be pulled onto the landing page. People want to find answers to their search on Google, so we want to put the best content in front of them that answers their search at the same time as presenting the Gospel. We have another free program we offer to churches called Social Partners in which we share graphics and videos to engage people through your church’s social media presence. These images and videos are unbranded and sent out every Tuesday through a process called Facebook crossposting. We have this available because we want to make it easier for church’s to reach their community on Facebook and other social platforms without having to worry about the content. Our services and programs are and will always be FREE. You read that correctly, F-R-E-E. We value our church partners and know that none of this would be possible without the servant hearts and desire to reach people online for the sake of the Lord’s Kingdom. If you have any questions, you can always call our office directly at 214 856 4678. 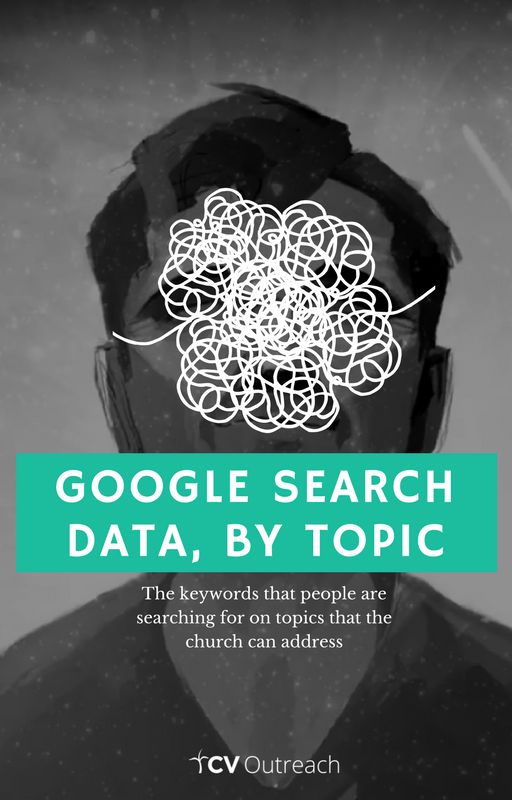 Curious as to what kinds of topics people are searching on google that your church is uniquely positioned to address? Download this free google search data resource and find out!